What was their financial situation? 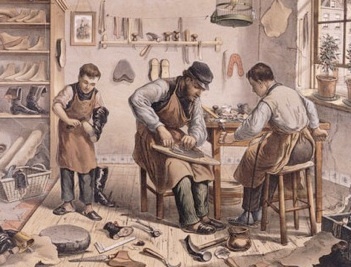 Were certain skills and trades considered part of a family tradition? Perhaps the most common occupation seen on land records and other documents is ‘yeoman.’ Yeomen were farmers who owned their own land instead of renting it or working on land owned by another individual. In the early years of American history, land was often readily available and families had to grow their own food in order to survive, resulting in yeomanry being among the most commonly cited occupations. Other occupational terms are no longer in use, but these terms applied to jobs which still exist today. For instance, a cordwainer, known today as a cobbler or shoemaker, was a surprisingly popular occupation, as cordwainers also tended to work in the construction of other leather goods. A Vulcan was another term for a blacksmith, who was a critical element of a successful community, as farming tools and weaponry were always in high demand. 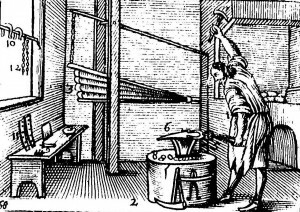 Other terms no longer in use today included housewright (a builder of houses) and lagger (a sailor). Interestingly, there are some occupations which, despite their archaic nature, still exist in small towns, particularly in New England. While these positions are sometimes regarded as honorary and exist only in a symbolic capacity, others jobs still involve performing the same tasks and are a part of town records. One such position in the latter category is the hog reeve, a title given to the person responsible for preventing and assessing the damage caused by stray hogs. In the seventeenth and eighteenth centuries, if a domestic swine escaped from its enclosure and caused damage to a neighbor’s crops, there could be serious implications. In the twenty-first century, such threats are minimal at best. In spite of this, as recently as 2006 the town of Grantham, New Hampshire, maintained the title of hog reeve, and while the position is unpaid, it remains a part of the town’s local history. As one can imagine, this statute was likely developed at a time when fence viewing was a more critical part of life in small communities across America. (Nebraska’s legislature dealt with matters regarding fence viewers as recently as 2007.) While these titles have largely become a formality in the twenty-first century, they were important enough in the seventeenth and eighteenth centuries to be mentioned in town records and in other records which are critical to the work of genealogical researchers. An awareness of these positions and the duties they entailed allow for a greater understanding of how they shaped our ancestors’ roles in their communities. Rodney Hall, Hall Genealogy Website, updated 22 September 2009. <http://rmhh.co.uk/occup/x-z.html#Y>. A List of Occupations, Rootsweb, <http://www.rootsweb.ancestry.com/~usgwkidz/oldjobs.htm>. Janice Brown, “New Hampshire Glossary: Hog Reeve,” Cow Hampshire, 8 April 2006 <http://www.cowhampshireblog.com/2006/04/08/new-hampshire-glossary-hog-reeve/>. Sonia Scherr, “This town has hog reeves . . . but not a hog in sight,” Concord Monitor, 22 March 2007 <http://www.concordmonitor.com/article/this-town-has-hog-reeves-but-not-hog-in-sight>. Town of Cummington, Massachusetts, “Annual Report For The Fiscal Year Ending June 30, 2013” <http://www.cummington-ma.gov/SiteAssets/Docs/Town/TownReportFy2013.pdf>. The Vermont Statutes Online, Title 24: Municipal and County Government, Chapter 109: Fences and Fence Viewers. Dave Aiken, “LB108 Repeals Fence Viewer Process,” Cornhusker Economics, Institute of Agriculture & Natural Resources, Department of Agricultural Economics, University of Nebraska–Lincoln, 7 March 2007. The Massachusetts town I live in still lists “fence viewer” as a town position. My great-great grandmother was listed as a “throstle piecer” in the 1851 UK census (a throstle was a nickname for a power loom, a piecer repaired broken thread on the spindles that feed the loom). Another now-archaic term I have found in local (Brewster, MA) records was “white smith” for a tin worker. My husband and I could’ve used a hog reeve many years ago when a nearby farmer’s pigs escaped and tore up our lawn! One of the sub-jobs for the fence viewer was to make sure that site lines were good; the town wanted intersections to have clear views of traffic (of whatever mode). I have suggested to our city council person that a fence viewer position would be good now. Many intersections have poor views of oncoming traffic (foot, car and rail). My great grandfather – before he was listed as a machinist in the Census – he was first listed as a “Chain Maker”. I assume he made links in the chains for anchors in shipping in New England. Great niche article Zach!! I am pursuing a Mayflower proof for “Fuller”, which I understand was a preparation process in the textile industry and fulling mills came to this country very early on, Go a few centuries before your article and many of these historic occupations became surnames: Baker, Smith, Carpenter, Fuller, Wright, when surnames were first thought to be necessary, either for legal purposes or pure vanity. A “flesher” was a butcher. 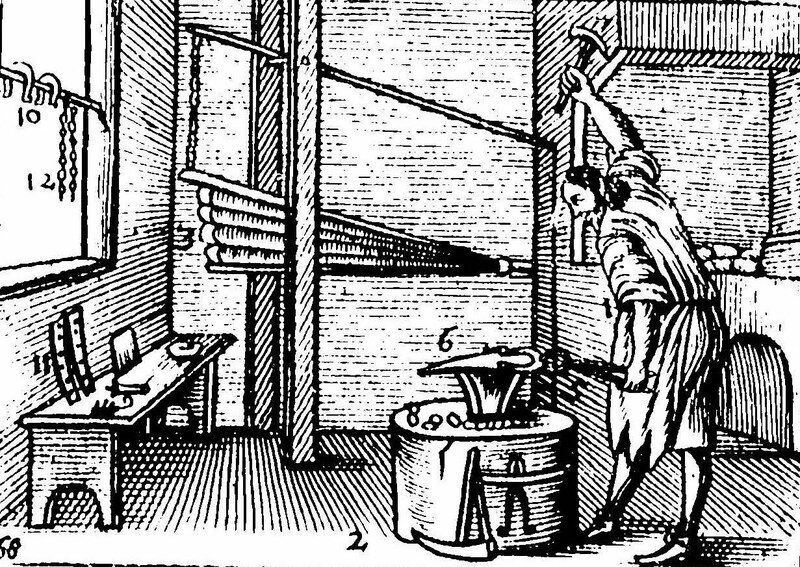 But what was a block maker? Thanks William – I will check further but that sounds right to me for his occupation. Don’t forget your current family when examining occupations. I realized there is a unique connection between genetics…what ” runs in families ” and the preponderance of relatives who choose similar occupations. This is unique since WWII since women and men both are graduating from advanced educational institutions and finding careers of choice. Sitting in the hospital with visitors in a semi circle surrounding me I looked from one face to another and began to count how many health related occupations were represented. My sister, an occupational therapist, my niece a certified EMT, my niece a licensed physical therapist, my niece a licensed physical therapist, my son- in – law a licensed nursing assistant (3 yrs in the Army), my daughter a licensed dental hygienist. My daughter in law’s sister a nurse practitioner and ditto my son in law’s sister, an emergency room nurse. So I seem to have a little indication of how our family is wired; gravitating toward medical, technical, and humanitarian occupations; not just jobs but lifetime commitment to healing.